When I was little, my dad used to read us Sherlock Holmes stories before bed. While my brother often took the opportunity to fall promptly asleep on his corner of the couch, the rest of us listened intently. I remember the big leather armchair where my dad sat, holding the book out in front of him with one arm, the dancing flames from the fireplace reflecting in his black-framed glasses. I remember the rise and fall of his voice as the suspense mounted beyond all breaking points, and finally, at long last the awaited solution, when it all made sense and I´d shake my head, just like Dr. Watson, and think, “Of course; it´s all so simple now that he says it.” I remember the smell of the pipe that my dad himself would smoke every so often, a fruity, earthy mix that made its way into the folds of the leather chair, and the outlines of the night through the curtained French windows. His pipe, of course, was ever-so-slightly curved just like Holmes´s. And I remember that final slam of the book, the thick pages coming together between the crimson covers, when he´d announce, “That´s it for tonight.” And off we´d go – not matter how much begging and pleading we´d try and what sad faces we´d make – upstairs, up to bed. And then there´s the one thing that wedged its way so deeply into my brain that it remained there, taunting me, for years to come, when the rest of the stories had long since faded into some indeterminate background and the adventures of Holmes and his faithful Boswell were all but forgotten: the steps. The steps to 221B Baker Street. How many were there? Konnikova asks. It´s the question Holmes brought before Watson in “A Scandal in Bohemia,” and a question that never once left Konnikova´s mind. As Holmes and Watson sit in their matching armchairs, the detective instructs the doctor on the difference between seeing and observing. Watson is baffled. And then, all at once becomes crystal clear. When Konnikova first heard it, on one firelit, pipe-smoking evening, the exchange shook her. Feverishly, she tried to remember how many steps there were in their own house (she hadn´t the faintest idea), how many led up to their front door (she drew a beautiful blank), how many led down to the basement (ten? twenty? She couldn´t even approximate). And for a long time afterward, she tried to count stairs and steps whenever she could, lodging the proper number in her memory in case anyone ever called upon her to report. She would like to make Holmes proud. Of course, she´d promptly forget each number she so diligently tried to remember – and it wasn´t until later that she realized that by focusing so intently on memorization, she´d missed the point entirely. Her efforts had been doomed from the start. What she couldn´t understand then was that Holmes had quite a bit more than a leg up on her. For most of his life he had been honing a method of mindful interaction with the world. The Baker Street steps? Just a way of showing off a skill that now came so naturally to him that it didn´t require the least bit of thought. A by-the-way manifestation of a process that was habitually, almost subconsciously, unfolding in his constantly active mind. A trick, if you will, of no real consequence, and yet with the most profound implications if you stopped to consider what made it possible. A trick that inspired Konnikova to write an entire book in its honor. The idea of mindfulness (neutral observation, passive listening presence) itself is by no means a new one. As early as the end of the nineteenth century, William James, the father of modern psychology, wrote that “the faculty of voluntarily bringing back a wandering attention, over and over again, is the very root of judgment, character, and will…An education which should improve this faculty would be the education par excellence.” That faculty, as its core, is the very essence of mindfulness. And the education that James proposes, an education in a mindful approach to life and to thought. In the 1970s, Ellen Langer demonstrated that mindfulness could reach even further than improving “judgment, character, and will.” A mindful approach could go as far as to make elderly adults feel and act younger – and could even improve their vital signs, such as blood pressure, and their cognitive function. We also know, more definitively than we ever have, that our brains are not built for multitasking – something that preludes mindfulness altogether. When we are forced to do multiple things at once, not only do we perform worse on all of them but our memory decreases and our general well-being suffers a palpable hit. Sherlock Holmes is a central inspiration in my own work as a paranormal investigator. In his article, Sherlock Holmes,Paranormal Investigator, the paranormal investigator Joe Nickell is describing how Holmes, in many of his cases, actually worked as a paranormal investigator. This is important since most of, if not all, of Holmes´ cases have some kind of supernatural mysticism over them. Though Holmes of course always solves it, and find a rational explanation. But it is central, partly, to my thesis about that Holmes, as Konnikova shows, had the ability of a meditative, passive listening presence, which lies behind his active, rational analyses, and intensified them. And partly that he was in some kind of spiritual crisis when he hadn´t got a case to work with, a Dark Night of the Soul of sorts, which he had to fill out with drug use. In my mind the image of Sherlock Holmes will forever remain the talented actor Jeremy Brett who played Holmes in the revolutionary 1980s TV series, The Adventures of Sherlock Holmes. 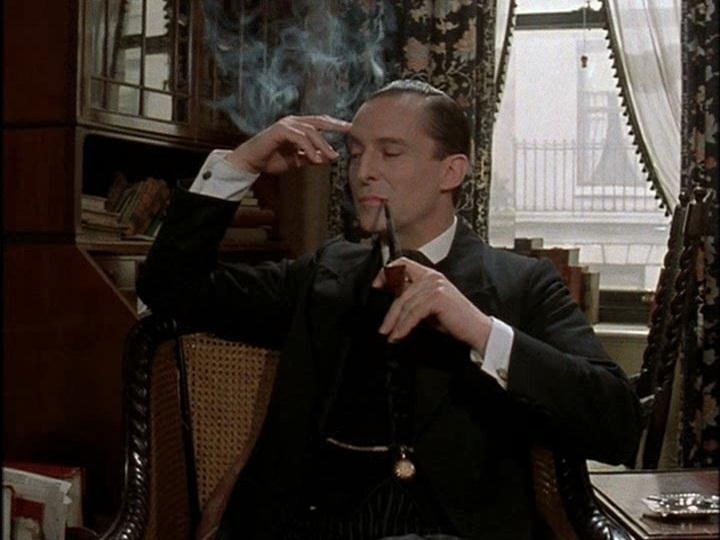 And while I feel that other such actors who taken on the Holmes role have given equally adequate performances – I enjoyed the versions played by Basil Rathbone and Robert Downey Jr. – no one will ever take the place of Jeremy Brett as Sherlock Holmes in my heart. But while the movies are fun, I´ve always held the opinion that the books are far superior and Sir Arthur Conan Doyle´s world famous literary character was truly innovative. Holmes´s astute logical thinking and objective rationality gives him a distinctive character. He is continuously unimpressed with the crimes and criminals he pursues and his unperturbed countenance makes him an exceptionally entertaining hero. We´re truly astounded by Sherlock Holmes because he is never astounded himself. Sherlock Holmes is, at his quintessential core, unemotional, objective, and completely rational. A true Stoic philosopher. He has also a lot in common with the philosopher Spinoza and later the Enlightenment philosophers. He uses logic, science, and strict analytical cognitive processes to solve his mysteries. Whether he´s handling the affairs of scandalous royalty as the world´s first and only “unofficial consulting detective,” chasing a murderer in the dead of night with his trusty hound Toby, or catching a treasure thief in an adrenalin-racing boat chase, one thing remains a constant: his logical an unemotional persona. Truly, most philosophical doctrine tells us that this state of being – to utilize our reason to overcome our passions – ought to be one of our ultimate goals if we wish to attain non-materialistic happiness. Sir Arthur Conan Doyle´s literary character Sherlock Holmes is the very person whom most philosophers believe that human beings should aim to be. Sherlock Holmes is an unemotional sleuth in search of justice. His cool and precise nature allows him to examine clues without prejudice and place each puzzle piece together until he has a complete picture before him. The crimes almost appear to the reader (and our beloved Dr. Watson) to be like elaborate illusions. Holmes, like the gifted illusionist, takes random, meaningless bits of information and connects them to show an undeniable chain of events. Once the illusion has been explained the magic disappears and we all believe it to be utterly simple. Another source of inspiration in my work as a paranormal investigator is my own concept of The Matrix Conspiracy. Here I see myself as a Matrix rebel, who helps people out of the labyrinth of the Matrix, by investigating and exposing the strange beliefs, amusing deceptions, and dangerous delusions of the Matrix agents and sophists. Here you can see Moriarty as the dark sophist king and Holmes as the philosopher, Socrates. The goal of critical thinking (rationality) is to arrive at the most reasonable beliefs and take the most reasonable actions. We have evolved, however, not to seek the truth, but to survive and reproduce. Critical thinking is, seen in that connection, an unnatural act (seen from a deeper perspective it is the opposite: here critical thinking is natural and irrationality is unnatural). Anyway, by nature, it seems, we're driven to confirm and defend our current beliefs, even to the point of irrationality. We are prone to reject evidence that conflicts with our beliefs and to attack those who offer such evidence. 3) The spiritual practice (going beyond all ideas and images – see my book Sûnyatâ Sutras – free download). Thought distortions are “techniques”, that, unconscious or conscious, are used from an interest in finding ways of getting on in the world, rather than an interest in finding ways of discovering the truth. Thought distortions are the background for poor reasoning, diversionary ploys, seductive reasoning errors, techniques of persuasion and avoidance, psychological factors, which can be obstacles to clear thought. Critical thinking, or philosophy, is in opposition to thought distortions. Critical thinking is about spotting thought distortions, and examining them by presenting reasons and evidence in support of conclusions. Critical thinking is the only tool you can use in order to explore, change and restructure thought distortions. It is not something psychotherapy should take care of. A central thought distortion in connection with that is Subjective validation. Philosophical counseling (true spiritual counseling) claims that our problems are due to a separation of the observer and the observed. In its practice it directs itself away from the observed, towards the observer himself. Psychotherapy directs itself towards the observed, and therefore tends to overlook the observer, and therefore the producer of thought distortions (read more under the thought distortion Subjective validation). The difference between the use of thought distortions and the use of critical thinking is very shortly said, that those who use thought distortions are in the control of the thought distortion Magical thinking, which is active when you don´t discriminate between image and reality, while critical thinking is active, when you do make this discrimination. No one should doubt that sophistry is alive and well. My concept of The Matrix Conspiracy is permeated with it. We see it in the mix of postmodern intellectualism (constructivism), management culture, self-help and New Age – and in the two main methods of this mix: psychotherapy and coaching (in the thought distortion Four philosophical hindrances I give a short introduction to the thoughts behind the Matrix Conspiracy). In Holmes´s perspective, written works should be purely scientific and informative. The philosopher Spinoza could not have agreed more. Spinoza himself amusedly called his style of writing in Ethics his “cumbersome geometric method.” He wrote in a fashion similar to a mathematical treatise, with definitions, proofs, and axioms all lined up in an orderly fashion. Spinoza´s Ethics is broken down into five parts. Within each part Spinoza states a proposition then proceeds to prove it and occasionally add a scholim, axiom, corollary, or other extremely boring and complex geometric term to his proof. I can see much of a similar style between Holmes´s “The Book of Life” (in A Study in Scarlet) and Spinoza´s Ethics. But Holmes especially reminds about the Stoics. Both Holmes and the Stoics lived their life accordingly to their teachings. The Stoics advocated a life in which we objectively examine our emotions (or passions) and understand them (what initiated their cause and their effect once in place) and then utilize reason to overcome them through an understanding of the external emotional stimulus. When we use reason to keep our emotions in check we allow ourselves to broaden our minds to the possibility of more advanced forms of knowledge. And with a greater understanding of life, the universe, and ourselves, we experience the highest form of contentment possible. Sherlock Holmes is the ideal model for the Stoic concept of Apatheia (Greek: from a- "without" and pathos "suffering" or "passion"). It refers to a state of mind in which one is not disturbed by the passions, which interesting enough also mean suffering. Holmes must have long ago eliminated the illogical nuisance of uncontrolled passions and chosen to live life through the utilization of reason. Because his mind is not cluttered with irrelevant and, therefore, useless thoughts that might hinder his investigations, Holmes is capable of examining clues and crime scenes with an almost automaton quality. It was not that he felt any emotion akin to love for Irene Adler. All emotions, and that one in particular, were abhorrent to his cold, precise but admirable balanced mind. He was, I take it, the most perfect reasoning and observing machine that the world has ever seen, but as a lover he would have placed himself in a false position. This dramatic tale begins with Sherlock Holmes´s unexpected visit to Dr. Watson´s consulting room. Holmes arrives looking thinner and more sickly than usual. One of his hands appears to be injured due to a violent confrontation that occurred that very night on his way to Watson´s home. Holmes immediately proceeds to close the windows to the room, securing them with bolts. Watson, aware that something is amiss, concludes that now that Holmes is frightened by something, though we should know by now that Holmes is never afraid but merely cautious. Holmes begins to relate to Watson his recent actives to bring down the villain Moriarty whom, Holmes believes, is behind all of the major crimes of the last few years. Moriarty, who is described as being “extremely tall and thin” and almost snakelike in his mannerisms, is described by Holmes as being the “Napoleon of crime.” He is Holmes´s intellectual equal and his moral polar opposite. In other words you could describe him as Holmes´s pain-body, his shadow (see my article The Emotional Painbody and why Psychotherapy Can´t Heal It and my book Lucifer Morningstar – a Philosophical Love Story). After an impressive battle of wits and intellect, Watson is left to conclude, at the end of the story, that during their travels through Switzerland, Holmes and Moriarty fell together while still in battle, plummeting down Reichenbach Falls where they both presumable perished. Indeed, while a thrilling tale on and of itself, what is most intriguing about this short story, in which we witness what was meant to be the death of one of the greatest detective characters of literary history, is that throughout its entirety, complete with all the death threats and very real possibility of mutually assured destruction, Holmes shows no fear and no regret. His temperament constantly remains calm and cool. If he does express an emotion it is never a negative or pernicious one but one of intrigue or amusement. Indeed, when dueling both physically and mentally against Moriarty´s vengeance Holmes was not depressed but energized. He was excited by the challenge of a worthy opponent and the tale played out similarly to a game of chess. From this we can see that whether engaged against his only potential love interest or battling to his presumed death, Sherlock Holmes maintains a Stoic countenance at all times. Stoic philosophy maintains that while there is nothing wrong with human emotions as such they can interfere with higher forms of cognitive processes. When an emotion is provoked by an external cause and is not properly reasoned through it can distract us from understanding the truth about said external cause by adding a personal element to an objective occurrence. One of the ultimate goals of Stoic philosophy is to achieve true happiness. And true happiness is freedom from suffering. This is found through philosophical exercises instead of any fictional happiness that can temporarily arise from materialistic gain (see my article Philosophical Counseling as an Alternative to Psychotherapy). For the Stoic happiness can be found only through freedom, the freedom that we can experience when we´re no longer controlled by our emotions and by our human ignorance. If we allow ourselves to merely react when an external challenge happens to elicit our uncontrolled emotions, we submit ourselves to forces that are ultimately beyond our control. Of course we cannot eliminate our emotions. No matter what, they are there. Even our renowned Sherlock Holmes cannot eliminate all of his emotions (just primarily the negative or passive ones). What reason does is to turn our active pain-bodies into passive pain-bodies by allowing us to understand them as clearly and distinctly as is humanly possible. Once we have a clear and distinct understanding of the pain-body, the more control we have over it, and the less active we are when we encounter it. The pain-body is the cause of suffering, and because we´re no longer in control of the pain-body set in place by external challenges we experience a kind of freedom from suffering, which for the Stoics, is true happiness. Stoic philosophy dictates, and Sherlock Holmes demonstrates, the idea that we ought to control our reactions to our emotions instead of allowing them to control us. We should relate completely neutral in relation to our pain-bodies (meditation), and through critical thinking seek to change the inappropriate basic assumptions, which are the thought-pattern behind the pain-body. That is how philosophy and true spirituality works (inappropriate basic assumptions are based on thought-distortions – see my book A Dictionary of Thought Distortions). So, here we see the difference between the philosopher and the sophists, who try to activate thought-distortions, and use them in order to get on in the world; Moriarty as the dark sophist king and Holmes as the philosopher, Socrates. But isn´t meditation supposed to stop the thoughts? And what has that to do with Sherlock Holmes, who is a master thinker? Well, as we saw in the beginning, there seems to be an aspect of mindfulness and meditation in Holmes. Let´s go into it. In a large number of books about meditation you are given the information, that the goal of meditation is, that the thought has to stop completely. However such a choice of words can function deceptively, because we need to think. In order to be able to do a piece of work, you must think; in order to be able to walk home to your house, you must think; linguistical we must communicate with each other, and language is a result of the thought. So what role does the thought have in life? The thought must be active when you are doing something. The thought is a necessity so that we can do no matter what technological work. In order to, that our actions can be clear, we must think clearly, objectively, without letting us be carried away by moods; without prejudices and preconceived opinions. It was this, the Enligthenment philosophers understood by the reason, and they share this with the Stoics. But we also know, that the thought produces human problems, fear and anxiety, and that this anxiety will hinder us in acting effectively. The question is then, whether you as a coming Holmesian mastermind can act without anxiety when thought-activity is required, and when it is not, be silent? Can you act with afterthought when it is necessary, and when it is not, let the thought rest? In fact it is rather simple. Can Man in that degree be so present in passive listening, that he in the awake condition will think and act when it is necessary, and remain awake whilst he acts, so that he neither falls asleep, or works pure mechanical? It is therefore not a question about whether you have to think or not, but about how to remain awake. In order to be able to remain awake you must have this deep understanding of the thinking and its consequences: anxiety, desire, hate and loneliness. You must be completely engaged by living with what you are, but not in sheer acceptance. Because at the same time you must understand it up from the ground. And you can only understand it fully when the mind is completely awake, without that it in any way is distorted. The question about when you have to act with afterthought when it is necessary - when the thought has to function clearly, objectively, and when you have to let it rest - is coming by itself, spontaneous and naturally, in the passive listening presence. Then the thought is made transparent in presence and reality. So, the thought is dangerous in a certain direction, the direction of self-production, or of the will to power: the direction, which separates the thinker from the thought, and creates absence. Nevertheless the thought has to function logical, sensible, objectively, healthy, in another direction. This other direction the Western philosophy has made very much out of investigating, for instance the Logic of Aristotle. But they have not only neglected the dangerous direction, on the contrary they have considered it as a presumption for philosophy: that you through thinking construct philosophies; that is: self-images and world-images, perspectives and conclusions. Therewith they have lived in the mistake, that the thought begins to function logical, sensible, objective, healthy - through teaching logic (though this is a good beginning). The dangerous direction of the thought is the past´s reaction, which intervenes, places the thinker outside, and produces an identity without wholeness. This lack of wholeness consists in the experience of being homeless, without belongings. To be without belongings is to lack foundation for your development, to be in the air, to be locked off from, or locked inside, without resort, hearth, seat, to be without place, without living space: the expression of anxiety itself. Anxiety is to have your identity in an absence, in the constant becoming something. In this self-production there is no being. Anxiety is therefore anxiety of nothing, anxiety of an uncertain threat. The uncertain threat paralyses the identity, precisely because it is uncertain. The inhibition in the anxiety is lying in the paralysation. Because the identity is paralysed in the anxiety, it is suspended. The hold, the grip of the world, which the identity is, is suspended. Anxiety is therefore an experience of an identity crisis. The whole of the situation is paralysed, and the space narrows around you. As a coming Holmesian mastermind you must therefore study the whole structure of the thinking, and see what place the thought has, see where it isn´t a necessity, and only then you will discover, that the mind functions in a reasonable way, both when the thought isn´t active, and when the thought has to be active. So the paradox is, that in the one direction - technological, instrumentally - the thought has to function completely pure and clearly, so that you in the daily life can function, earn your living etc. - and in the other direction it produces anxiety. The thought is in this way necessary on some levels, but when the thinking in philosophical sense projects itself as the past and the future, and produces anxiety as well as secureness, the mind is becoming absent, and the inevitable result hereof is unreality, emptiness, boredom and ennui. So in philosophical sense the thought must rest, so that the anxiety in existential sense can stop. In the higher degree that the thought is logical, sensible, healthy, objective, unsentimental, impersonally, the more effective and capable it is. Here the Enligthenment philosophers and the Stoic philosophers were right in their view of the reason. In the sense the thought is necessary, in that sense you must use the thought in order to be able to function in life. And still the mind must have the ability to be completely free from all kinds of distortion, so that it can find out what is true. There must be harmony between the living function in the thought and freedom from the thought. To be the movement of time present in passive listening - the thinking, which projects itself in philosophical sense - is not an option. Choosing is a part of the same movement from the past, to divide, to say yes and no, to accept and deny, accentuate and exclude, to remember and throw out projects, to produce self-images and world-images - the whole of the historical being of Man, the thinking´s philosophical activity. But to be this movement present in passive listening, is not itself a movement, which originates from the past. To observe neutral without the symbol of the thought, is an act in which the past has stepped aside. When the Taoist monk is sitting and observing a tree passively without any kind of thought-activity, then it is an act, which isn´t defined by the past. And passively to observe and feel the past´s activity is also an act without past. To be the past present is to be one with your past, without that there is any displacement or distortions between the realizer and the realized. The condition in which something is seen is more important than what is seen. To be the past present in this observation without evaluation is not only to act differently, but to be different. In such a presence the memory acts unhindered and effectively, because it in the presence is made transparent. Holmes´s technique is in that degree to be present, without that it is something he has chosen and constructed. It is to have his identity in a presence, and this identity he has discovered, not constructed. There is freedom from the known, Holmes´s perspective, even when the perspective acts where it necessarily must act. To have your identity in a presence is to be safe in existential sense, it is to feel at home in life, and in your relationships with the surrounding world. Existential safety is the utterance of freedom, where you fold yourself out, or are resting; where you fill out, or are allowing yourself to be filled out, without basic restlessness, or fear. Basic seen you are in confidence. Safety is in the good, and is the safety of the good, it is trust and self-reliance in one. At the same time safety also is space, width, both physical space and spiritual space. But usually the perspective, the known, the past, still once in a while acts even where it should not act; actually it acts constantly and causes conflict. But to be aware of this is to be in a condition of inaction concerning the active past. Freedom from your perspective, the known, is in this way truly an ethical life. It means that you have discrimination, and don´t pull your perspective down over others. But it doesn't mean, that the known is deleted, but that there is introduced a completely new dimension where you are the known present in passive listening, where the known so to speak is made transparent in being and openness. This act, to see and feel without dividing, choosing, ruling and controlling, is the act of love. The ethical life is this act, and all life is this act. The real life is the being where you are one with yourself, with life and love. You are in the middle of the stream of life. Where the unreal life is characterized by, that emptiness and loss slide in between, create reflections, displacement and darkness, in relation to the Now, to the facts, to the existential conditions, then the real life is characterized by fulfilment, middle and light. And that is altogether the reason in flowering. In many of Plato´s dialogues Socrates ends the dialogue with a fundamental question, which puts into question the whole basic perspective of the dialogue partner. Implicit in this Socrates is saying, that any image of life is relative, and that it eventually is about going from having some images of life, to having a philosophical life-practice. This is a nihilistic moment, but not an expression of nihilism. A part of Albert Camus´ philosophy was about, that we usually live in two dimensions: a superficial dominated by conventions, norms and moral – but under this, life shows its true face in form of the meaningless, absurd and cruel. Camus´ little novel The Fall is for instance about a man, Jean-Baptiste Clamence, who, when he was a lawyer, from end to end had order in his life, like Holmes. One evening in Amsterdam he sees a young woman jumping into the river. Without trying to help. Then he suddenly remembers a parallel occurrence in Paris. And these two events become the triggering factor for, that his existence breaks down. A condition he in the end is accepting, because he hasn´t got any philosophical life-practice. It is a nihilistic moment that reminds about the moment in spiritual practice, where all images and ideas are leaving the mind, the creative emptiness. And in this accept he therefore experiences some kind of happiness, but it is not the spiritual happiness, it is without realization and compassion. It reminds about it, but it is not the same. In spiritual respect it is still unhappiness, illusion, the separation of the observer and the observed. It is also the nihilistic moment the main character in Proust´s In Search of Lost Time, experiences when the objects for his falling-in-love-projects disappear, and he discovers the arbitrariness, or meaninglessness, nothingness, in his project-determined life-situation. It is a break in his constant becoming something; this becoming, that has a past and a future, which so far have formed an unbroken continuum, but which reality necessarily, from time to time, is breaking down, unless you are very out of balance. The breakdown shows ifself in the anxiety. And it is this, which does, that we immediately start with a new project. We do this, because we don´t have any philosophical life-practice. Nothing could exceed his energy when the working fit was upon him; but now and again a reaction would seize him, and for days on end he would lie upon the sofa in the sitting room, hardly uttering a word or moving a muscle from morning to night. When Holmes has no work be becomes utterly depressed to the point of lying on the couch for days on end. To alleviate the depression, Holmes abuses powerful hallucinogenic drugs in an attempt to stimulate his mind. So, it seems that he is experiencing this fundamental Socratic question, which puts into question his whole basic perspective. Implicit in this Socrates is saying, that any image of life is relative, and that it eventually is about going from having some images of life, to having a philosophical life-practice. This is a nihilistic moment, but not an expression of nihilism. Holmes philosophical life-practice is his detective work, which we have seen reminds very much about Stoic philosophy. But he lacks some philosophical exercises to do when not working. And taken the power of his mind into consideration (where meditation, conscious or unconscious, seems to play a great part) he needs some very powerful substances to substitute this. Therefore he uses drugs. And, taking the power of his pain-body, Moriarty, into consideration, as well as the paranormal mystery which lies over nearly all of Holmes´s cases, then it seems like he is of some kind of spiritual crisis, a Dark Night of the Soul. Moriarty´s shadow gets control of him. The awakening of Kundalini. Described as a snake-like energy, which in spiralform moves ifself from the foot of the spiral column up in the head, while it opens a line of psychological centers, called chakras (see my articles The awakening of kundalini, and What are chakras?). The phenomenon is especially known in connection with the Indian Tantrism. Para-psychic opening. Visual, auditory or emotive knowledge about a past and a future, which lies outside your own personality. Is especially known in connection with different types of clairvoyance. Also known in connection with astral travel or astral projection (out-of-body experiences). Spiritual crises as a hero´s journey. The experience of yourself as a hero who travels through a mythological and fantastic empire, filled with good and evil forces, as well as a fount of other sharply marked opposites. The crisis takes you farther and farther back into the past – through your own history and the history of humanity, all the way to the creation of the world and the original ideal state of paradise. In this process, you seem to strive for perfection, are trying to correct things that went wrong in the past. It often culminates in the meeting with death and the following rebirth. Such death-rebirth themes are known from ancient schools of mystery, as well as in the transition rites of scriptless peoples´ religions (see my article The Hero´s Journey). The shamanic crisis. At the beginning of his career the shaman often goes through heavy ordeals, the so-called initiation crisis. The initiation often includes a journey to the underworld, where the shaman aspirant goes through terrible ordeals with diverse demons and other mythological creatures. As in the hero´s journey the initiation often culminates in the experience of death, dismemberment and extinction. Typical the extinction then is followed by resurrection, rebirth and ascension into heavenly regions. Channeling. The ability to make contact with divine creatures and levels of consciousness, which is thought to possess informations of spiritual value for people, and through the body mediate communication from these levels. Close encounters with UFOs. Experiences of unusual light phenomena, communication with aliens, or experiences of being abducted by aliens, or of travelling with them to other worlds. Breakthrough of memories from past lifes. Sequences of experiences, which take place in other historical periods and/or other countries/planets – or in connection with karmacial experiences. Near-death experiences. Experiences, which are connected with death or the death process. This can be experiences of anxiety or existential guilt, but also experiences of a peaceful, harmonic condition after death. Possession states. An experience of, that your mind and body (it can also be things or places) have become invaded and are controlled by a being, or an alien energy, which can be of divine or, most known, demonic kind. Often with inexplicable bodily manifestations. ​Oneness-consciousness. Experiences of oneness between inner and outer, strong positive feelings, transcendence of time and space, feeling of holiness and paradoxical nature. It sounds like a genuine mystical experience, but it is not. It is rather a so-called peak experience - about the problem of peak experiences read my article A critique of the Indian Oneness movement and its use of Western success coaching). Alcohol and drug abuse. The strong longing after alcohol or drugs corresponds on a low level to our own being´s spiritual longing after wholeness: the unification with God. The important role of the Ego-death under the above-mentioned types of spirituel crises is a direct parallel to the abuser´s experience of “hitting the buttom.” Can for example be seen reflected in the “Beat Generation”, and the works of the Beat writers. Another aspect of alcohol and drug abuse as spiritual crisis, is that alcohol, and some kind of drugs, can relieve the intense stress from other kind of spiritual crises. Spiritual crises are not due to mental disease, but are manifestations of time and its more collective images; that is: the collective history of the astral plane. These manifestations are often accompanied by some deep and powerful energies (or forms of energy), which penetrate the whole of your being. And this can, in the meeting with the pain-body (the thought´s negative energyfield in the body), be heavy filled with suffering. Therefore such crises often in the psychiatric system are misdiagnosed as mental disease, due to a lack of knowledge about, or rejection of, such forms of energy. This often makes the crisis even worse. 1) Burning hot or ice-cold streams, which move up through the back. 2) Excitation in the abdomen, along the spine, and up in the head. 3) Vibrations, restlessness or cramps in legs and other places in the body. 4) Pains, tensions or stiffness in the back of the neck, as well as headpains. 5) Fast pulse and increased metabolism. 6) Sensitivity to sounds, people´s presence and other influences. 7) Sense of orgasms different places in the body, or total, cosmic orgasms. 8) Mystical/religious experiences, revelations and/or cosmic glimpses. 9) Para-psychic abilities, light phenomena. 10) Problematic balance between sexual impulses and spiritual urge. 11) Problematic balance (contradiction) between living a temporal life and a spiritual life. 12) Anxiety because of uncertainty about the process. 13) Weakened concentrationpower and lapses of memory. 14) Sleeplessness, manic exaltation alternate with depression and lack of energy. 15) Total isolation because the inner experiences can´t be communicated out. ​ (read more in my article Spiritual Crisis as the Cause of Paranormal Phenomena). Holmes will sacrifice his life, not just his physical duration on Earth, but his all-consuming mental facilities to maintain his constant mental activity. Holmes´s use of morphine and cocaine, then, suggests that he is acting, consciously or unconsciously, against his conatus in that the use of drugs will potentially (and drastically) shorten his existence. That would certainly be in the spirit of Moriarty. We can convincingly conclude that he is irrefutable acting against his conatus by purposefully performing actions that instead of promoting longevity perform the opposite. This is what is happening when one´s pain-body gets control over you. However in philosophical counseling this nihilistic moment is a very important moment. Therefore I also often ask my own guests to read Albert Camus´s small novel The Fall, as a way of getting the counseling practice started. The nihilistic moment is a so-called Bardo state, a possibility for spiritual practice, a possibility for opening yourself in towards the Source. It namely also implies the question of, whether there can be a complete philosophical freedom, wherein the human mind is facing something, which not is of time, not is pieced together by thoughts, and which still not is an escape from the facts of the daily existence: the timeless, the absolute, truth or reality. So, when Holmes and Moriarty fell together while still in battle, plummeting down Reichenbach Falls where they both presumable perished, this can be seen as a transcendence of both Holmes and his pain-body Moriarty. Many of Conan Doyle´s stories begin with Dr. Watson praising the wit and brilliance that is Sherlock Holmes´s mind and capabilities. Indeed, though often thought narcissistic and conceited by the local authorities whom he assists, Sherlock Holmes deserves every ounce of the self-importance he feels. And what´s more, we love him for it. There´s something about the intellectual hero that is simply engaging, especially in today´s culture. Our modern day conception of a hero now involves (more often than not) an intellectual crime solver instead of the brash cowboy of recent years. Whether Dr. Gregory House in House, Dr. Temperance Brennan in Bones, Mr. Spock in Star Trek, or Captain Picard in Star Trek: The Next Generation, if you prefer, or any number of the characters found in American television shows such as CSI Miami or Criminal Minds, you´ll find that it´s the intellect instead of the brawn that saves the day. And Sherlock Holmes just may have started it all. His cold and impassive nature makes him stand apart from the passionate few whose success rely more on good luck than anything else. I find it fascinating that this creation of nineteenth-century literary genius should follow so closely to the image that a man from the seventeenth century proposed. I find the correlation between the Stoic philosopher and Sherlock Holmes´s sleuthing truly astounding. And it´s intriguing to see how these ideas have blossomed into the characters of our modern day protagonists. Whether considered together or separately, the Stoic philosopher and Holmes have seemingly helped pave the metaphoric road for the modern conception of a hero. Why? Why is this ideal of an intellectual hero so appealing to us? Why is it that we love Holmes´s unemotional objectivity or care about the Stoic ethical implication that such a life presents? Holmes and the Stoics have already spelled it out for us. Utilize reason and logic when you act and do not let your emotions govern you. Get in control of your own life and your own sense of self. Avoid ignorance, create brilliance. Open yourself up to a whole new world of thinking and understanding and gain the respect (or, quite possibly, the annoyance) of those around you. With study and discipline we can become the House, or the Bones, or even Sherlock Holmes of any field of study. Perhaps the most wonderful about Sherlock Holmes and the Stoics is simply this, that they truly have no superhuman qualities to them, no magic powers beyond our own meagre means. What makes them special is what we ourselves have within us. We too can become that which so astounds us.